From R&D and prototype precision dicing to full production lapping and polishing, Valley Design can do it all. 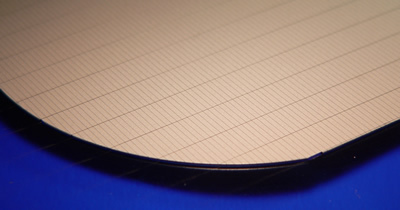 For over 35 years, Valley has been providing dicing of micro precision wafers and substrates for a wide range of high technology applications. Utilizing programmable DISCO and K&S saws, parts can be diced to micron level tolerances with 200X optical magnification. Valley has recently expanded its dicing department, and now offers one of the largest production dicing capacities in the industry. Parts can be diced as small as 0.127mm square. Valley dices both customer supplied wafers and parts, as well as dices parts from our extensive material inventory. Materials diced include Fused Silica, Aluminum Nitride, 96% - 99.8% Alumina, Glass of all types, Silicon, Sapphire, Silicon Carbide, Macor ceramics, Ferrites, Germanium, Polyimides and PEEK, metals and more. In addition to dicing services, Valley offers a true one-stop shop including CNC 4 axis micromachining, Lapping and Polishing services, Ultrasonic Hole Drilling, backgrinding and other precision machining services for custom and standard parts from as small as 0.127mm square to 450mm diameter wafers. Valley has even processed parts as large as 72” long. For more technical details on our prototype and production dicing capabilities please go to www.customdicing.com.